(United Nation Headquarters, New York, September 30, 2015). President Peter Christian participated in the formal ceremony to launch SIDS Dock, the first global intergovernmental organization of island nations with the full powers and privileges of the United Nations (U.N.). In his remarks, the President expressed FSM’s support for the goals of SIDS Dock, which are to transform energy sectors in small island developing states (SIDS), to catalyze sustainable development and to help generate financial resources for climate change adaptation. The President was joined at the event by FSM Ambassador to the U.N. Jane Chigiyal, newly-confirmed FSM Ambassador to China Carl Apis, FSM Ambassador to the U.S. Asterio Takesy, Director of Environment and Emergency Management Andrew Yatilman, Deputy Permanent Representative Jeem Lippwe, and Assistant Secretary of Budget and Economic Management Eugene Amor. 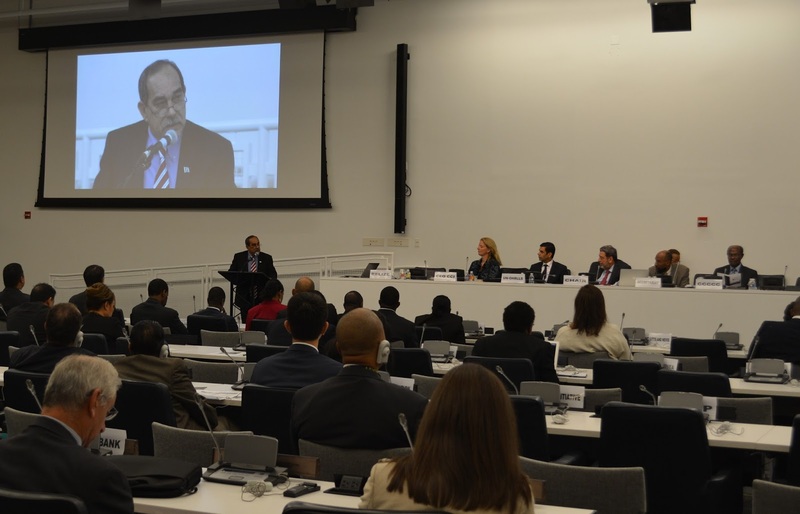 The ceremony was presided over by Ralph Everard Gonsalves, Prime Minister of Saint Vincent and the Grenadines and Acting Chair of SIDS Dock, who explained that it is called “SIDS Dock” because it is meant to be a “docking station,” to connect the energy sectors in SIDS with the global market for finance, sustainable energy technologies and carbon markets. Samoan Prime Minister Tuilaepa Aiono Sailele Malielegaoi also participated in the event and delivered remarks in support of SIDS Dock, especially its dedicated financial mechanism that will cut out the middleman, meaning that partners will be able assist SIDS directly and SIDS will not have to tailor project proposals to the different requirements of various agencies. Other leaders, ministers and high-level representatives of both island countries and partner countries, including Austria, Denmark and Japan, participated in the ceremony as well. Also present were representatives of the U.N. Industrial Development Organization (UNIDO) and other U.N. bodies and partner organizations like the Clinton Climate Initiative. President Christian then paused to offer condolences to the Caribbean nation of Dominica in the wake of Tropical Storm Erika and to express his hope that Dominica’s God-given resilience would assist efforts to overcome this disaster. After noting that FSM had signed the SIDS Dock Statute in September 2014 at the Third International SIDS Conference in Samoa, the President confirmed that FSM was committed to supporting the goals of the initiative. The President highlighted the importance of renewable energy to island economies and lives. He noted with disapprobation that island countries must spend so much of their cash on fossil fuels simply to keep alive the generators to power their industries, their homes and the facilities that need electricity.